The Zuni Indians are known to be exceptional Lapidary craftsmen. They started cutting Turquoise into needle shaped stones about the 1920-1930 period and called it Needlepoint. Zuni Needle Point Jewelry is still very popular today. Typically, many needlepoint shaped stones are grouped in a pattern to create a very attractive piece of Zuni Needle Point Jewelry such as a ring, pendant, earrings and so on. Zuni Needlepoint Jewelry is delicate and is not recommended for men, it is precious and is a wonderful choice for a modern day woman. This is a beautiful Zuni Needle Point Necklace made by Edmund Cooeyate. Notice how Edmund laminated Coral and Turquoise together and then cut them into Needlepoint stones. You can clearly see how different in style Zuni Needlepoint Jewelry and Zuni Inlay Jewelry are. One thing you will notice is that the Zuni Native American artists favor the color combination of Turquoise, Coral and Mother of Pearl. The Zuni Silversmiths make Zuni Needle Point jewelry in all different colors, but traditionally they make Turquoise Jewelry, Coral Jewelry and Mother of Pearl Jewelry. You can really see how much time could go into making a work of art such as this wonderful Zuni Needle Point jewelry style necklace. This is a colorful Zuni Needlepoint Necklace and a credit to Edmund Cooeyate! This is a classic Turquoise Zuni Needle Point jewelry Necklace and Zuni Needle Point jewelry Earrings Set by Bryant Waatsa, Jr. Look at the detail in the stone work and intricate bezel work. The needlepoint Turquoise stones almost look like little blue porcupine quills. Each piece of this necklace will take hours of tedious work to complete. Bryant is a Zuni Native American Indian Jeweler; his specialty is Needlepoint Necklace Sets, Pendants, Earrings and more. 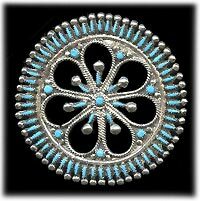 This Turquoise Zuni Needle Point jewelry pin/pendant was made by V.S. 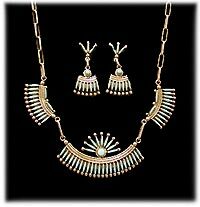 Johnson, a Zuni Native American Indian Jeweler and Artist. Each sliver and Zuni Needle Point jewelry Turquoise Stone is set in a silver bezel and this is very time consuming and tedious work.The beautiful pin looks to be modeled after a daisy or some other sort of flower, but the silver accompanies the Zuni Needle Point jewelry stone work is also reminiscent of a snowflake design. This beautiful Turquoise Needlepoint Bracelet and Ring set was made by Libert and Carol Peyketewa who are both Zuni Indians. Libert and Carol make a variety of Zuni Needlepoint Jewelry items such as Rings, Earrings, Pins, Pendants and Bracelets. 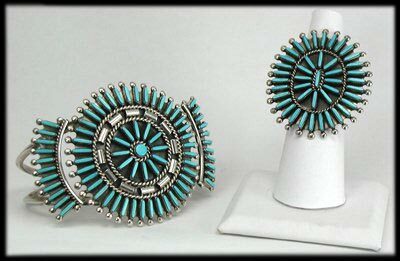 Their work is classic Zuni Needle Point jewelry design and collectors quality. 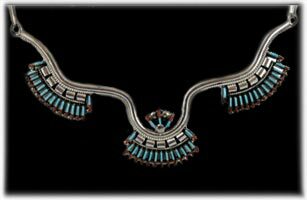 We hope you have enjoyed this small presentation on Zuni Needle Point jewelry.